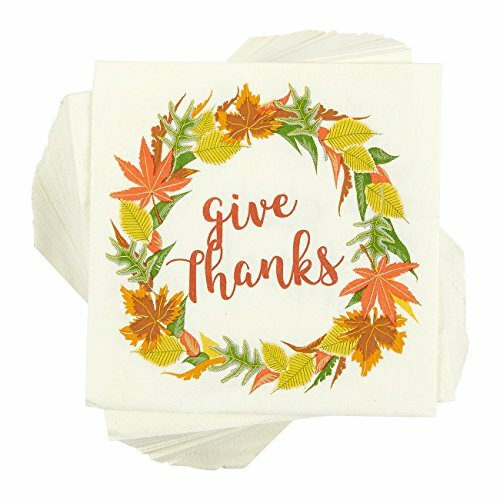 SET INCLUDES: 100 highly absorbent 3-ply napkins made from paper featuring a Thanksgiving theme design with autumn leaves and ¡§Give Thanks¡¨ print. THICK AND DURABLE: Each sheet is 3-ply to ensure that it doesn't tear easily when used. It's also highly absorbent and soft to ensure a comfortable wiping experience. FUN PARTY DECORATION: Make a statement with these cute printed napkins which are sure to complement your party dinnerware; perfect for parties, celebrations, cocktail evenings, luncheons, or buffets.